Back Yard - Yes or No? We are looking at getting a family dog - we're considering a cocker spaniel. My question is, would a cocker do well in the following environment? My wife and I both work and our two children are in school 6th grade and freshman in high school. Therefore the house is empty until evening. We have a large fenced-in backyard that the dog could play in during the day. There is a doggy door in the service door coming into the back of our garage which would be accessible to the dog from the back yard. So the dog could get out of the elements when needed. We would have the dog in the house whenever we were home and the dog will likely sleep in a kennel cage in the house at night. Would a cocker do well in this environment or is it more of a full time house dog. Also, what are the negatives of having a cocker? Cocker spaniels are very much a family dog, and although they love the outdoors, and being around people, they can be fairly adaptive to their environment. I know of many cocker owners who live in apartments or flats and whose cockers seem to be happy and healthy because they're given lots of exercise and trips to the park to keep their tails wagging. There's no doubt that having a yard where your cocker spaniel can get out into the fresh air and have a run about is much better than being cooped up indoors all day. Even better if they have access to a warm, (or cool, depending on the weather) dry, area to retreat to - just don't forget to leave a large bowl of fresh water for him each day. Cockers don't like being left alone all day, so leaving a selection of toys and perhaps a treat-filled Kong, will help to keep him occupied. If it's possible, perhaps a neighbour or friend could pop in at lunch-time to take him for a walk or give him a little play time. At the end of the day, when you return home, I'd recommend you take him out for a little exercise - throw a ball or a Frisbee to get him running - get his heart and lungs pumping. 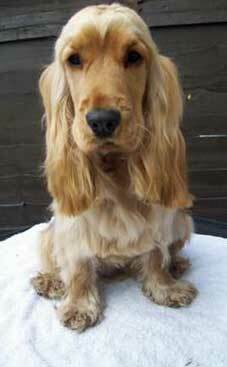 As for disadvantages to owning a cocker spaniel - I'm probably biased, so you're asking the wrong person. I really don't see any disadvantages to owning a cocker spaniel! I recommend you read the following articles for more information about the cocker spaniel - this may help you to make up your mind. Comments for Back Yard - Yes or No? As a cocker owner myself, I would have to agree with Pauline that there is virtually no negative to owning a cocker. BUT I would advise you that you cannot over-estimate the amount of grooming they need, especially if they have a long, silky haired coat. Their ears in particular need careful attention and they will need to be brushed daily to ensure grass seeds etc don't end up matted in their fur. These are things you get used to, but I was unprepared for this and was quite shocked at how bedraggled my cocker looked if I skipped even one day of grooming!